The size, spacing and fixing of roof battens or purlins shall be in accordance with the relevant code approved specifications. The batten and fixing must have adequate strength to laterally restrain the roof trusses. Fix each batten to every lamination of every truss. In addition to providing support to the roof cladding, roof battens prevent truss top chords from buckling. The buckling action is due to the compressive force in the top chord of the roof truss. The roof battens resist the roof battens which in turn transfers it to the steel roof bracing and down to the supporting structure. Each element and fixing in the sequence is essential for roof structure stability. 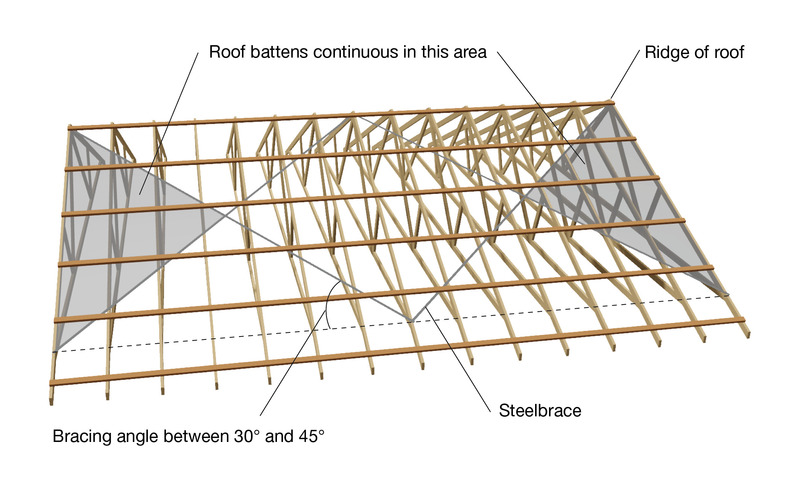 In areas where battens or purlins are not bound on both sides by diagonal bracing, battens shall be continuous (see Figure C1-04-01-01). Where required, splices in battens shall be arranged so no more than one-third of battens are spliced and no two splices are adjacent in any top chord. For more information, refer to Multinail Technical recommendations for Roof Battens. Important note: DO NOT splice roof battens on girder trusses.